Our Christmas Card this year might be my favorite card we have had. Now it half killed me actually getting them out but I loved them so much! These are some of the pictures that Kim Sharit took for us in October which I love. Then I found this digital etsy card on pinterest that I bought. I knew I wanted chevron and I loved the gray and white because it matched their clothes... yes I am dorky like that I like the card to match our clothes. The original card had red where mine is yellowish gold so I ask the designer to change that red to match the color in Brylee's dress. I think she did great! Then she emailed it back to me and I sent them to Costco to have printed. I was very impressed with Costco's prints I will be using them for all my prints in the future. They are a great price and great work too! 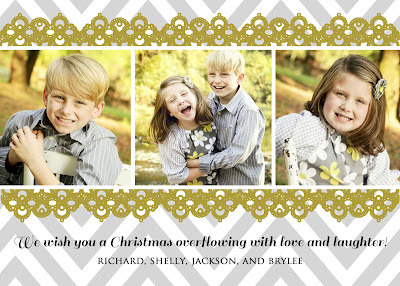 GoGo and Grandaddy sent out Christmas cards too. I took our pictures in the sleigh at Mt. Laurel which was interesting to say the least. Setting the self timer and running to get in was not easy and taking a picture of all 6 of us was hard too I can do 2 and 4 but 6 was a little more difficult. Wouldn't you know the last one we took was the best! I did the same thing with their Christmas Cards as I did with mine. I bought a digital print off etsy for theirs as well. I picked a chalkboard look with snow since we were in a sleigh and changed the wording from the sample as well. She emailed it back to me and I sent theirs to Costco as well.